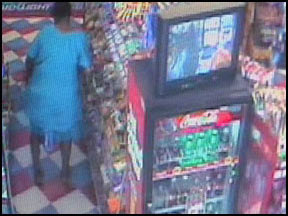 Lisa Newsome (shown in the surveillance camera still on the right) has been arrested for theft. The crime she has confessed to police: stealing a 12-pack case of Miller Lite beer from Crossroads Grocery and attempting to leave the store with it... by carrying the beer between her legs and hidden under her oversized house coat! If you look carefully at the photo you can clearly see the crate of Miller Lite protruding from... well, under her attire. Police in Zachary are reporting that Newsome "attempted to show us how she did it, but we told her not to pull her pants down." I wonder how far she got walking away with that thing? It was easier than it looks. She was stealing LIGHT beer.